This is a new printing of the original edition on sturdy, acid-free paper. 32 pages. All markings are original. Highest quality guaranteed. Size of music is 9.5" x 12.5". $15.00. Franz Liszt, originally Liszt Ferencz in Hungarian, (1811-1886) studied composition with Antonio Salieri with influence from Berlioz and Paganini. He wrote “Les Preludes” in Weimar in 1847 based on themes from an earlier choral composition. It is a tone poem with the program of describing life as a series of musical preludes. Edwin Arthur Kraft (1883-1962) was born in Connecticut and studied at Yale with Horatio Parker and in Paris with Guilmant and Widor. His transcription of this well-loved symphonic work calls for the resources of a large orchestral organ and was written during the year of the dedication of the V/150 E M Skinner (1922) in the Cleveland Public Auditorium where he served as municipal organist. Difficult. Compare with the Grasse transcription. 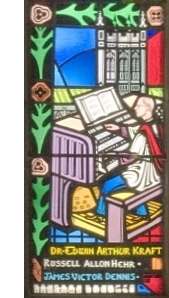 Thomas Murray played the IV/166 stop Newberry Organ (Hutchings-Votey, Steere, Skinner) in Woolsey Hall of Yale University, New Haven, Connecticut, 1992. MP3 Buy “The Transcriber’s Art” at Gothic Records.